Rebecca brings up a good point about the importance of being prepared for dental emergencies when they occur. We never know when one of our children might lose a tooth in an accident. 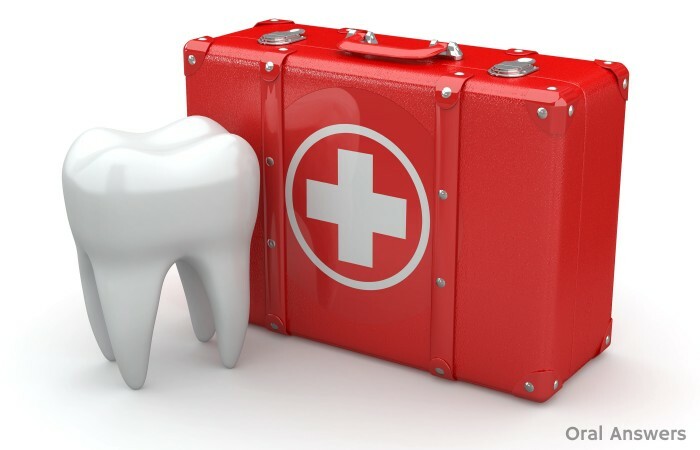 If you’re interested in making your own dental first aid kit, there are many items that you may choose to include, depending on your level of dental experience. Also, you need to know if you want to pack regular oral hygiene items (such as toothpaste and floss) in with your main disaster kit, or if you want to include it in your dental first aid kit. For the purposes of this article, I will simply go into the things that you may want to have on hand in case a dental emergency occurs and you are unable to make it to the dentist for whatever reason. You can use the list below to find some things that you may want to include in a dental first aid kit, broken up into a few categories. 1 – Medical-Grade Exam Gloves – Even if you’re comfortable reaching into your child’s mouth without gloves, it may be a good idea to wear gloves anyway due to the germs that you have on your hands. 2 – Dental Mirror & Flashlight – If a piece of tooth chipped off, or if someone has lost a tooth, it’s a good idea to look inside of the mouth and see if there is anything remaining at the site of the accident. A mirror can also help you visualize the tongue-side of the front teeth. 3 – Save-a-Tooth System – The Save-A-Tooth System is simply a saline solution that is compatible with our bodily fluids. It is the best way to keep a tooth “alive” when it is knocked out and not immediately re-implanted. It is important to remember that a tooth can only be outside of its socket for a few hours before the probability of successful re-implantion starts to go down-hill fast! In short, you only need to get this if you’ll be able to make it to the dentist within a few hours of having a tooth accidentally knocked out so that the dentist can re-implant the tooth. 4- Temporary Crown and Filling Material – These materials, which I talked about in a previous post about the best temporary crown cement can help you get by until you can see a dentist. Note that it is always best to see a dentist first when a crown or filling falls out. To learn more on this topic, read about what to do when a filling comes out and what to do when a crown falls off. 5 – Dental Wax – Wax can be used to help with irritation from braces or a chipped tooth. Some people have also used it to temporarily fill in a lost filling. Dental wax can be found for pretty cheap on Amazon. 6 – Toothbrush & Tweezers – When putting a loose crown back on and replacing a lost filling, it is important to make sure that the tooth is clean by using a toothbrush. You’ll also need a good way to handle the filling material, which is where the tweezers come in. 7 – Sterile Gauze – Gauze placed over the site of bleeding can help stop bleeding. You can also use gauze to move the tongue (it’s usually pretty slippery with gloves on!) so that you can see what’s going on inside the mouth. 8 – Tea Bag – If bleeding hasn’t stopped with just gauze, it can sometimes help to place a wet tea bag inside of a piece of gauze and hold that over the wound to stop bleeding. 9 – Hydrogen Peroxide – If you need to disinfect and clean up blood, hydrogen peroxide good to have around in your dental first aid kit. 10 – Floss, Toothpicks – Sometimes tooth pain is simply caused by food that is stuck between teeth that can easily be removed with floss and/or toothpicks. 11 – Clove Oil – Clove oil (or eugenol in dental-speak) has a sedative effect on the dental pulp and can be used to help alleviate tooth pain. Many dentists use eugenol in their offices to help calm down teeth after deep fillings. This is why clove oil is commonly associated with the dental office smell. If you’re looking for a quick way to get some clove oil into your dental first aid kit, it can be found along with sesame oil in these Red Cross Toothache Medication Drops over at Amazon. 12 – Ice Pack – An ice pack can help reduce swelling when a tooth is lost. At my dental school, whenever we extract a tooth, we recommend that the patient place an ice pack on their face intermittently (20 minutes on, then 20 minutes off) to reduce swelling. 13 – Orajel or Anbesol – Sometimes Orajel or Anbesol can do a better job at relieving oral pain than clove oil. When giving an oral anesthetic to your children, it’s important to be aware of methemoglobinemia, a serious side effect. 14 – Pain Medication – Over the counter pain medication, such as ibuprofen and acetaminophen can help relieve oral pain, but should only be taken as directed. 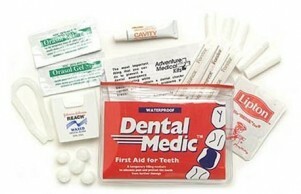 Dental Medic Dental First Aid Kit (Pictured to the left) – This kit includes dental wax, floss, a tea bag, and an oral pain reliever among other items. It also has an instruction booklet for dealing with common dental emergencies and comes in a waterproof bag. 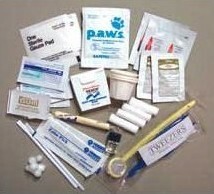 Emergency Dental Kit (Pictured below) – This dental first aid kit appears to include a few more things compared to the dental first aid kit above. It includes a mirror and appears to also have a container of clove oil included. If you’re looking for some other options, this Google Shopping results page and this page at Amazon both show many other dental first aid kits that are available. Dental first aid kits can be valuable assets when it comes to your oral health and your children’s oral health. 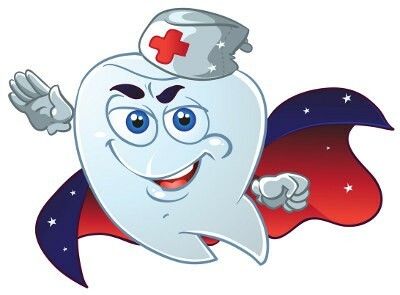 Nobody knows when an emergency will occur, so it is always a good idea to be prepared to handle dental emergencies. Do you have any questions or comments about dental first aid kits? I’d love to hear what you have to say in the comments section below. Thanks for reading! Just a suggestion…a mouth guard. I know it sounds strange but if you have an accident that leaves your teeth jagged but not in pain, it will help so you don’t cut your lips and mouth. Of course this is only temporary until you can get to the dentist. You are correct Kelly, a mouth guard should be included in this list as it can be really helpful in temporarily replacing teeth to their position in case of any accident. 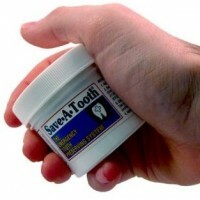 As it is an emergency kit it is used only until you reach the Dentist. What a fantastic dental aid kit! I know several dental students who do not have this kind of prep.